Over the years the Volkswagen Golf has become the small hatchback to beat. What started out as a humble replacement for the Beetle is now seen as the benchmark that all other hatchbacks are judged by. And almost 30 million have been sold worldwide. But the gap is closing. The competition is now better than ever and Volkswagen is well aware of that. At the official unveiling of this, the seventh generation Golf, Volkswagen took the unusual step of talking about how good the Ford Focus is. It seems the Germans might be just a bit worried. It's not only the Focus either. A few years ago people would have laughed if you'd have mentioned Hyundai and Kia in the same breath as Volkswagen but the Korean brands have shown unprecedented improvement in the past 10 years and the i30 and Cee'd are seriously good cars. Volkswagen even faces competition from within – the much anticipated new SEAT Leon arrives early next year. But if you're expecting a radical new look than you'll be disappointed. 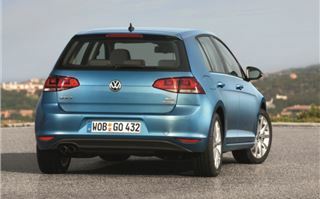 The Golf is based on the same subframe (called MQB) as the new Audi A3 and SEAT Leon so it's no surprise to see a similar profile. Volkswagen has played it safe with the styling. Very safe. This Golf looks unnervingly similar to the old one at first glance, especially from the front. Park new alongside old though and you'll notice the more angular lights and a wider stance. Similarly at the back there's a more squared off look. It's a neat rather than daring design. 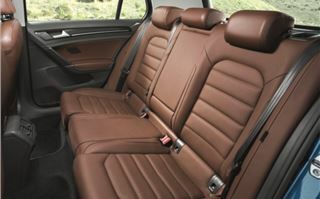 Similarly the interior is an evolution of the previous Golf. The dials and switches are all familiar but they've been improved, the central console is now angled toward the driver and there's a new steering wheel. It looks good, especially the piano black trim, but it's the quality that really impresses. All the controls work with precision while the finish is impeccable. 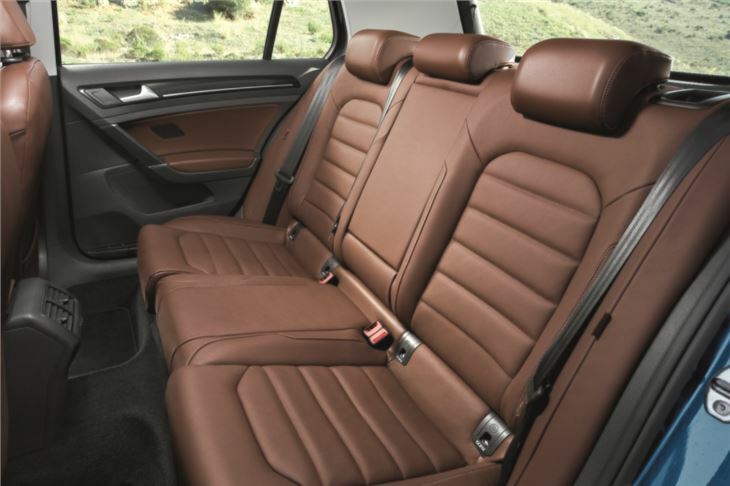 Impressively it's a big step up from the outgoing Golf - already a quality interior - and easily up there with Audi and BMW standards. One highlight is the excellent seats. They strike the ideal balance between comfort and support so even after long hours behind the wheel you don't feel any aches or twinges. There's also more space inside. This Golf is longer and wider than the model it replaces but it has a stretched wheelbase. 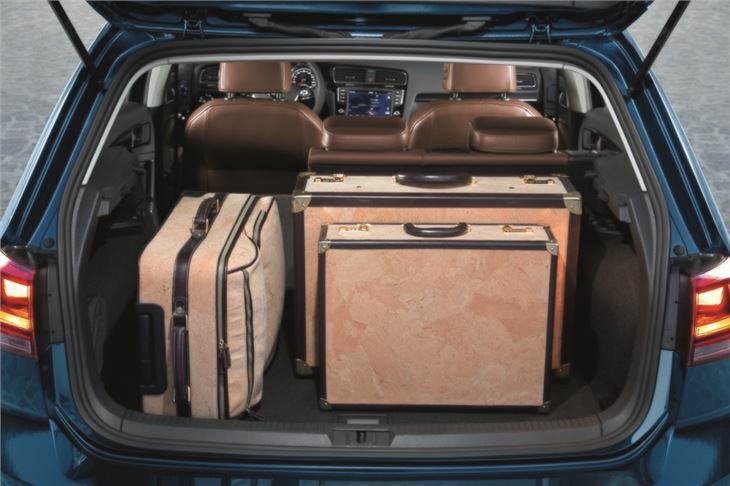 As a result there's more room for passengers in the back and a larger boot too - up from 350 litres to 380 litres. Despite this increase in size the new Golf is actually lighter. Volkswagen has managed to shed 100kg - the equivalent of a (substantial) adult passenger from the new model which benefits both economy an handling. The latter is further helped by the XDS system - an electronic differential that was first seen on the SEAT Leon FR and Skoda Fabia vRS. This allows the wheels to turn at different speeds and can slightly brake an inside wheel in a corner while sending more power to the outside wheel. You won't know it's there, but the XDS system makes a huge difference to the handling compared to the old Golf. It's far more nimble in corners, requiring less steering input in tight bends, so the Golf is far more enjoyable to drive. There's superb grip from the front tyres and a nice weight to the steering too. Luckily the ride hasn't suffered and is smooth and refined in models with multilink rear suspension. All the engines now feature BlueMotion Technology including a start/stop system. From launch the base model will be a 1.2 TSI with 85PS plus there's a more powerful 105PS version of the same 1.2-litre unit. There are also two 1.4 TSI engines – one with 122PS and another with 140PS which features Active Cylinder Technology. The latter only comes in the top GT trim. The diesels are the 1.6 TDI with 105PS which averages a claimed 74.3mpg with 99g/km. The 2.0 TDI has been re-engineered and now develops 150PS with an official 68.9mpg. Impressively every engine in the Golf range emits less than 120g/km CO2 which makes for cheap VED. We drove the 1.4 TSI 140PS engine with the clever cylinder deactivation system. This disengages two of the cylinders when the car is under light loads, so for instance when you're off the accelerator and the car is coasting. From behind the wheel you don't notice any difference at all, from when it deactivates to when it turns them back on again. That means you're able to enjoy what is one of the best petrol engines around. 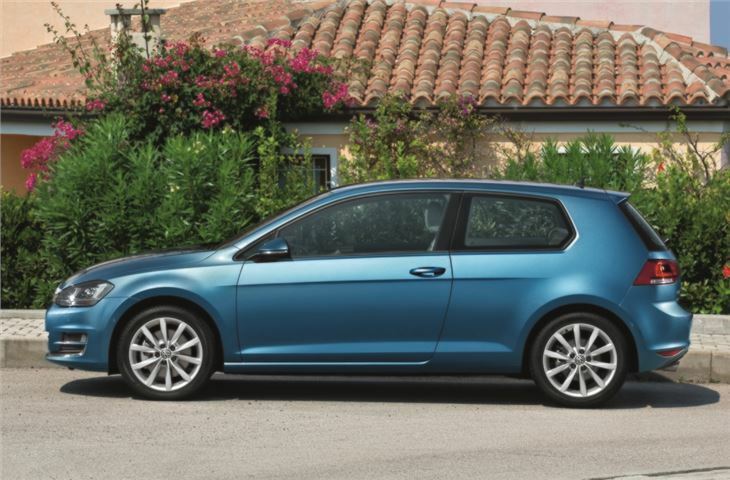 The 1.4 TSI is a real gem, helped by the positive shifting six-speed manual gearbox. It works just as well with the seven-speed DSG automatic thanks to plenty of low down pulling power. The turbocharged engine revs freely and offers genuinely impressive performance. Ten years ago this wouldn't have felt out of place in a Golf GTI. It's full of character and zest making it hugely enjoyable to drive, yet it still returns a claimed 58.9mpg according to the official figures. It's very refined which also goes for the 2.0 TDI. This engine is a mainstay of the Volkswagen range (and of course Audi, SEAT and Skoda) and has been redesigned for this new generation of Golf. It now develops 150PS with a more powerful 180PS version is on its way soon. 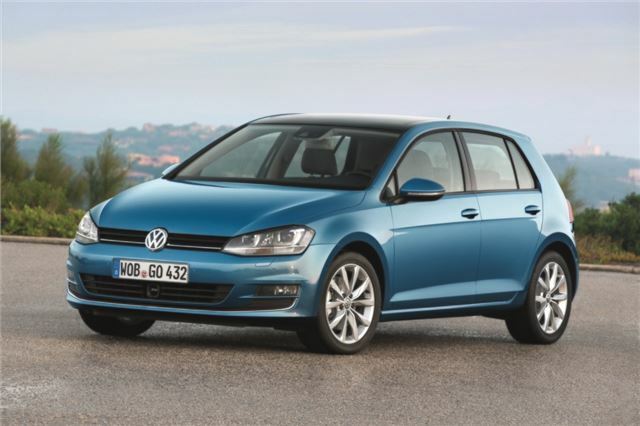 It's a hugely flexible engine and suits the Golf perfectly thanks to it's relaxed yet powerful nature. Compared to the outgoing version of the 2.0 TDI this one is quieter and delivers its power more smoothly, adding to the upmarket feel of the Golf. It's fast too with great in-gear performance and a 0-62mph time of just 8.6 seconds for the standard 150PS model. Official economy is 68.9mpg. 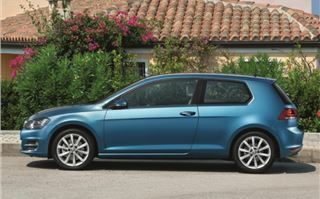 Prices for the new Golf start at £16,330 which gets you a 1.2 TSI 85PS three-door model in S trim. Yes it gets steel wheels rather than alloys but the S models are still well equipped. Every Golf comes with Climatic air conditioning, the 5.8-inch colour touchscreen (with a clever proximity sensor so that menus appear before you even touch it), Bluetooth and impressively DAB digital radio. The cheapest TDI model is the 1.6 TDI S three-door at £18,955. It may not be a revolution in car design but then Volkswagen hasn't tried to reinvent the wheel with the new Golf. Instead they've taken the qualities of the outgoing model and added to them with improvements in every area. It's a hugely capable and high quality car that goes about its business in a fuss-free fashion. It may not break any boundaries but it does everything you want it to and it does it very well. As an all-rounder it can't be bettered. In fact it's pretty much perfect. 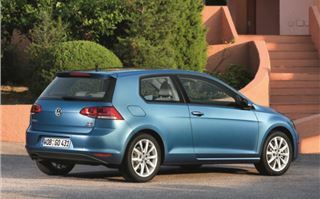 Footnote by Honest John 12-6-2013: Basic 3-door Golf VII 1.2TSI 85 at £16,495 driven. This is the best argument yet against paying considerably more for a diesel. You accept it is the 'base' model, but don't feel short-changed because, though it has a plastic steering wheel and lacks steering wheel radio controls, it still feels impressively solid and well built. You get a DAB radio, Bluetooth, electronic diff lock, a velour lined glovebox, a near silent turbo petrol engine. And outstanding economy. On a 30 mile drive I watched the meter rise from 46mpg to a highly impressive 51.5mpg.